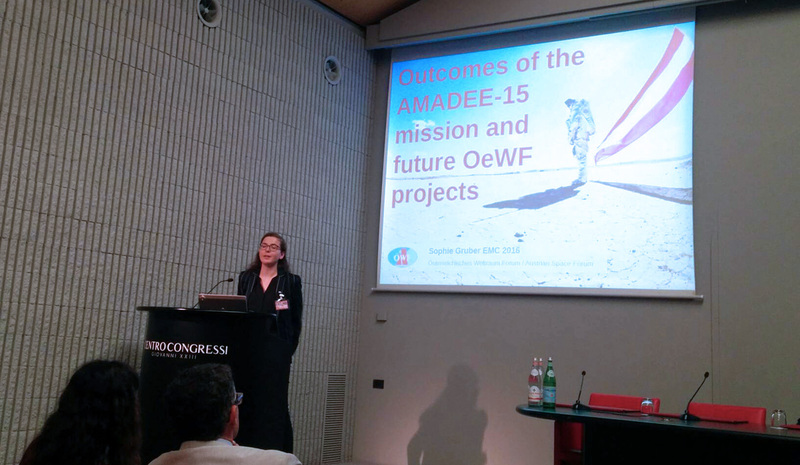 Posted by OeWF in AMADEE-15 Simulation, OeWF News. After a bus ride through the picturesque landscape of Italy, I arrived in Bergamo at the European Mars Society Conferece, full of expectations and ready to discuss the future of Mars exploration. As it turned out, I should not be disappointed – but let’s start at the beginning. Friday, the first day of the conference, started with an introduction to human Mars exploration. 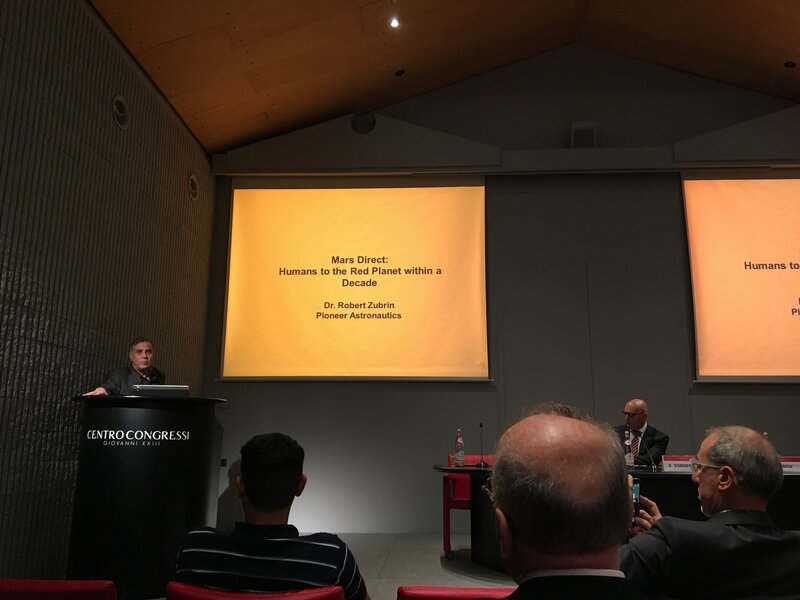 Dr. Robert Zubrin presented the “Mars Direct” scenario and illustrated his idea of how human Mars exploration could take place. Further plans and scenarios were presented and everyone talked about the urgency, as well as the desire, to bring humans to Mars. In a room full of members of various Mars Societies and research institutes, there obviously were heated discussions over different approaches to Mars exploration. Some of them even lasted until the original Italian ice cream after dinner. It became clear how much humanity has achieved throughout the past century and that it is upon us to carry this heritage into the future. The next day featured presentations on various distinct topics, among them “Mars rovers“, “Space industry and Mars” as well as „Human and social factors“. The last one was particularly interesting to me, since we must not forget that next to rovers and habitats, we are also sending humans, which are the most valuable cargo. Without a question, those who will be the first humans to set foot on the red planet will have to be stress resistant, durable and team-oriented. But which kinds of stress will a human experience during long phases of isolation (or their simulation)? And how does one get the required nutrition on the way to Mars? These and many more questions were answered, some in very creative ways. One presentation featured a greenhouse which runs on solar power during the day and on additional energy to wind mills during the night. I was not the only person in the room that was surprised by this proposal since the atmospheric pressure on Mars is very low (a hurricane on Mars would be comparable to a slight breeze on Earth). After diner, we were given an exclusive tour through the historic city of Bergamo by Antonio Del Mastro, the president of the Italian Mars Society. Despite it being late already, the streets were still very busy and the old buildings, some of them from the 15th century, seemed very impressive as they were lit by a full moon. 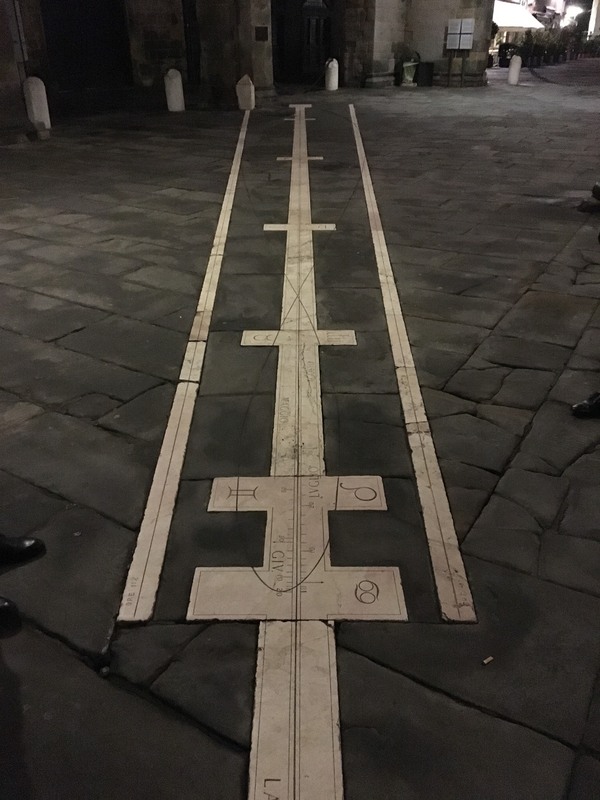 There might have been a strong contrast between the future-oriented themes at the conference and the antique so-called “Città Alta”, the upper city of Bergamo, but we still found a nice thematic connection: there were engravings on the floor in front of the dome which, for hundreds of years already, showed the respective month and day depending on the position of the sun (see the picture). This illustrated to me how exact the astronomers at the time were working already. Sunday was the final day of the conference, which also featured my presentation about the AMADEE-15 mission and future projects of the Austrian Space Forum. Obviously I was very nervous, but in the end, everything went according to plan and after some questions from the audience, the moment I had prepared for throughout the week was over. Following some presentations on Mars simulations which discussed the conference’s theme “From Simulation to Reality”, as well as a panel discussion on the future of European spaceflight, the conference had concluded. With that, two and a half intensive but productive days came to an end. It was really a very exciting weekend! Finally, I want to extend a sincere “Thank you” to the Austrian Space Forum and the Italian Mars Society, which made this journey possible!